10|07|20 - According to news reports the company that owns the building for the National Italian American Sports Hall of Fame and managed by long-time sports executive Jerry Colangelo has been told by a bank that it plans to foreclose on an $8.5 million loan and sell the hall's memorabilia. Colangelo is also the Chairman of the National Italian American Foundation. According to the article, if full payment wasn't made by Friday, it would foreclose on the mortgage and sell off the hall's memorabilia. George Randazzo, the hall's founder and chairman, was in Washington D.C. yesterday, with Mike Piazza, NIASHF's national spokesperson, and was unable to comment n the news reports. 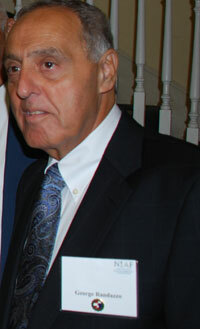 NIASHF was founded by Randazzo in 1977. In 1998, Mr. Randazzo asked Colangelo to serve as the chairman to build a new building for the hall. In 2000, the new facility was dedicated "the Jerry Colangelo Center."